A few blocks from my apartment is San Francisco there’s an organic grocery store. Everything there is pretty pricey, and the lines are pretty long, so it’s not exactly my go-to spot for groceries….but they happen to have a pretty killer beer collection. Whenever I do stop by the store (typically to buy meat, because it’s amazing there) I always window shop the beer section as well, and often pick up a few unique bottles to take home. 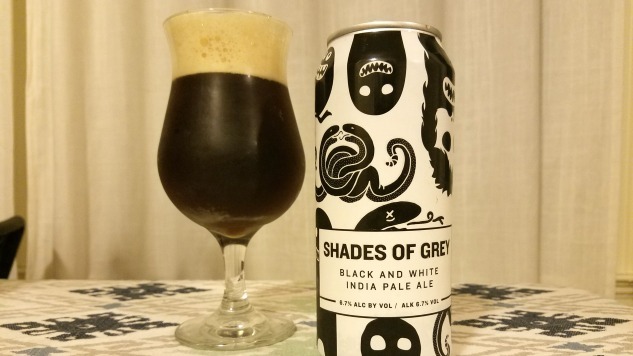 On my last trip I came across this gem, Shades of Grey, a collaboration between Against the Grain in Louisville, Kentucky and Magic Rock Brewing in Huddersfield UK. The can was initially what drew me to the brew. It’s phenomenally designed and definitely stands out on the shelf. Black skulls, monsters, serpents, and a sasquatch(?) cover the white can, many of which have some texture to them. It’s a “black and white” IPA (get it? Shades of grey? ), meaning the breweries took the two sub-styles of IPA and squished them together in some sort of vivisection-like experiment. In theory, you’ll get the maltiness of the black IPA and the Belgian spice of the white IPA. And that’s pretty much how it plays out. The beer pours a copper brown with a large, creamy head and excellent retention and amazing lacing. The hops and malt are perfectly balanced with hints of pine, caramel, black malt, and just a touch of citrus. It would be easy for any part of the beer to have become overwhelming, but this truly was a beautiful, well-balanced brew. I wasn’t entirely sure what to expect when I cracked the can open, but I was really happy with what I found. This was an absolutely delicious brew and makes me want to seek out some more Against the Grain brews in the future. Side note: if you haven’t checked out their beer list you totally should. Their beer names are a little… different, and are absolutely worth a read.